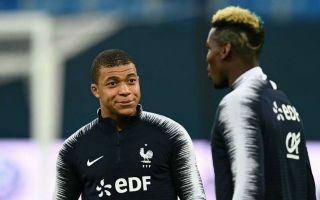 Manchester United midfielder Paul Pogba has admitted he and some of his France team-mates have discussed the recent big Champions League game between the Red Devils and Paris Saint-Germain. Pogba missed the second leg of that epic Champions League tie due to suspension, but will no doubt have loved seeing United come back from 2-0 down in the first game to win 3-1 away at the Parc des Princes and go through on away goals. Now on France duty with a number of PSG players – Kylian Mbappe, Presnel Kimpembe, Layvin Kurzawa and Alphonse Areola – Pogba admits his international colleagues were ‘disgusted’ by the result. However, the 26-year-old also says they’ve only brought it up a bit and mostly laughed it off now. ‘Yes, we talked about it a bit [with the PSG players],’ Pogba is quoted in the Metro. United will take on Barcelona next in the Champions League quarter-finals in what promises to be another classic this season. The Catalan giants will be among the main favourites for this season’s trophy, but United have shown they cannot be written off under Ole Gunnar Solskjaer.